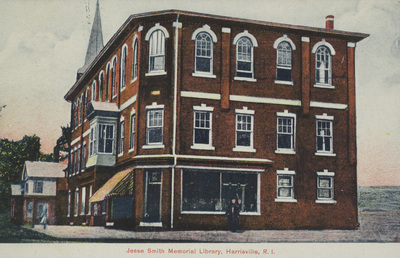 "Jesse Smith Memorial Library, Harrisville, R.I." by J. P. Davis, Pascoag, R.I.
Jesse Smith Memorial Library, Harrisville, R.I.
J. P. Davis, Pascoag, R.I., "Jesse Smith Memorial Library, Harrisville, R.I." (1915). Rhode Island Postcards. 314.